The Upper Lake Calif., driver survived a caution-filled SPEARS Southwest Tour race to take yet another checkered flag at the 3/8-mile track and clinch the series' season championship in the process. 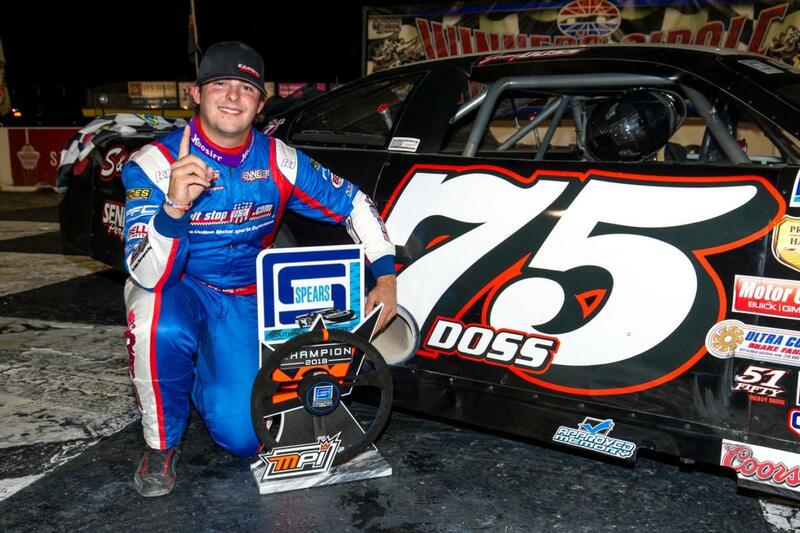 Doss - who won the $15,000 Senator's Cup Fall Classic in Las Vegas last month - led the majority of the 150 laps and crossed the line 1.206 seconds ahead of Eric Schmidt for the $10,000 winner's check. "I'm just so happy to get the championship," said Doss, who needed to finish ninth or better at the season finale to sew up the series title. "We've gotten second twice in the series points, so it feels so good to get the championship and top it off with a win here. I felt like I needed to get out front and set my own pace, and the cautions didn't count the laps down, but saved my tires." Doss led Ricky Schlick at the race's midway refueling break, which came at 70 laps, and nailed at least a dozen re-starts to maintain his grip on the front of the pack. He was thrilled to claim his first SPEARS Southwest Tour Series championship at a place he loves racing. "This is my favorite track, for sure, and so it felt good to come here for our final points race," Doss said. "This is the track I feel I'm best at, and I'm so happy." "It's been great, and the guys behind me here, I can't thank them enough," Johnson said. "I've got to give it up to Chris Bray for building a great car and getting it all squared away at the halfway break so I'd be able to get the job done at the end. I know where there's a great, fast car if I choose to run again next year." Tanner Reif dominated the 40-lap Jr. Late Models feature, taking the checkered flag ahead of his brother, Tyler, by 2.512 seconds. Tanner Reif - who finished second in The Bullring's 2018 Jr. Late Models points standings - won three times in the regular season and was happy to return to the short track's Winner's Circle. "It feels good to win in our hometown," Reif said. "I'd like to thank my crew, my parents, my sponsors and all my friends who came out tonight." USAC HPD Midgets racer and fan favorite Toni Breidinger led every single lap on her way to a breakaway victory Saturday night by 9.517 seconds. The win was her second in two nights, as she won the series' Friday night feature as well. "This track is an amazing track to race at, it's a lot of fun and the competition is always good here," Breidinger said. 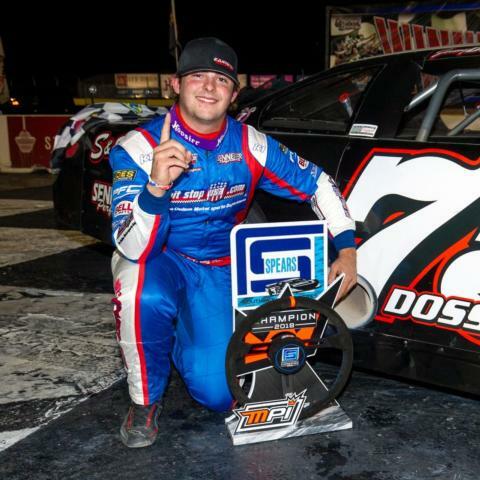 "I'm just trying to move up the ladder and get to where I want to get to in racing. I've driven so many different cars for so many different teams, and it's been a huge learning experience." 1. Tanner Reif; 2. Tyler Reif (-2.512 seconds); 3. R.J. Smotherman (-4.361); 4. Joey Iest (-4.830); 5. Jadan Walbridge (-9.937); 6. Cody Kimele (-13.750); 7. Braden Conner (-1 lap); 8. Olivia Manke (-2 laps). 1. Toni Breidinger; 2. Joey Iest (-9.517 seconds); 3. Cody Jessop (-10.080); 4. Dillion Tucker (-10.167); 5. Kylie Ith (-1 lap); 6. Natalie Waters (-1 lap); 7. Johnny Nichols (-1 lap); 8. Adam Lemke (-29 laps). 1. Jeremy Doss; 2. Eric Schmidt (-1.206 seconds); 3. Ricky Schlick (-2.387); 4. Cole Moore (-4.226); 5. Tyler Fabozzi (-4.798); 6. Cameron Haley (-5.228); 7. John Dillon (-5.436); 8. Carlos Vieira (-5.799); 9. Cale Kanke (-6.570); 10. Craig Raudman (-7.401); 11. Bob Lyon (-8.756); 12. Scott Sanchez (-9.867); 13. Randy Hendrick (-10.431); 14. Mike Beeler (-14.018); 15. Jack Wood (-1 lap); 16. John Moore (-3 laps); 17. Matthew Wendt (-8 laps); 18. Joe Farre' (-8 laps); 19. Thane Alderman (-24 laps); 20. Jeff Bischofberger (-25 laps); 21. Austin Herzog (-27 laps); 22. Bear Rzesnowiecky (-39 laps); 23. Chris Clyne (-57 laps); 24. Tracy Bolin (-60 laps) 25. Blaine Rocha (-80 laps); 26. Kyle Neveau (-106 laps); 27. Jacob Gomes (-126 laps); 28. Dan Holtz (-126 laps).